30 Metres of Repeller Ribbon. Home 30 Metres of Repeller Ribbon. Repeller ribbon is a safe, non-toxic method of preventing damage by nuisance birds and animals. Repeller Ribbon's holographic surface flashes and reflects light to drive away birds. 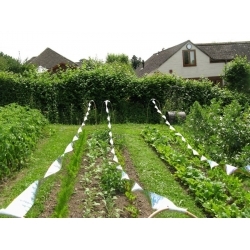 Iridescent tape flashes and relects light to repel birds, deer and other nuisance animals, Protects fruit and vegetable gardens, seedings and newly seeded lawns. Welfare-friendly deterrent that is safe for wildlife and pets. Bird Scarer. Wind Powered. 5 Pack. Bird Spikes - Anti Roosting Spikes.